My area of Hobie interest this evening has been adding a motor to my TI. A question for those of you with transom mount trolling motor experience - what length shaft works best with the TI? I've been looking at the MotorGuide VariMAX V45SW Kayak model with an 18" shaft. Does this sound too short or just right? It may not answer that question, but you will find some helpful info in this new article. From the top of the motor mount to the centerline of the propeller is 20 inches (just measured it). The motor mount board is a pressure treated 2x4 and the bottom edge is even with the side rail of the boat in that area, this means from the rail edge to the centerline of the prop is 16 inches. If I have the motor at 14 inches when sitting and driving from the front seat the prop grabs too much air and looses most of it's power. 14 inches is ok if you are solo and sitting in the back, but when you turn right the prop pull up air, so I guess the answer is 16 inches from the rail to the prop centerline which should work in all conditions (including very rough water). Be careful with that 18 inch shaft it might be too short on a TI if you use that Island hopper motor mount. By looking at their pictures it looks like the top of the motor mount to the water will be 8-10 inches above the water (4 inches lower than mine). According to the MotorGuide specs you take that measurement from the top of the transom to the waterline and add 20 inches. This means I'm assuming that you would need a 30" unit (according to their specs (which doesn't sound right either). Hopefully someone else will chime in here that has an electric on their TI. Then again that Verimax might be just fine, but I would definately check it all out before you buy it. I'll definitely build my own mount, I want it to be as minimalist as possible. I was thinking 18" was probably too short. I used to have a Minn Kota 3HP on a Coleman Ram-X 15 canoe. I don't know what length it's shaft was, but it was too long and that mount was a good bit higher from water level than a mount on a TI. Sure wish I still had that motor mount, it was all aluminum and would be perfect attached to a couple pieces of PVC pipe! If 18" is too short, I guess the best thing to do would be to get a longer shaft motor and cut it down to the perfect length. The "Hobie Drive System" is interesting and I have also been looking hard at the eVolve system. I have a couple worries with both. First, it seems that they would be prone to damage if you hit something, possibly even damaging the drive well. 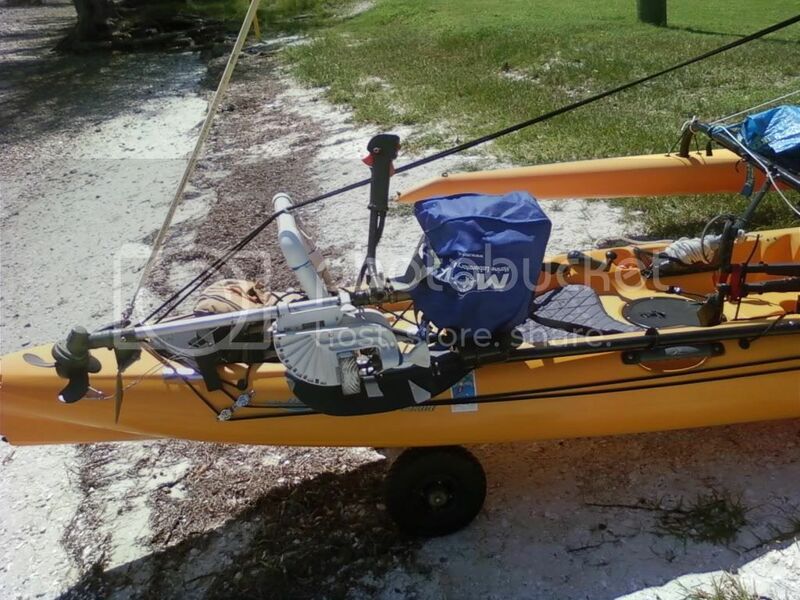 Second, when approaching the dock or beach, based on my experience with my canoe and Minn Kota 3HP, I can have my motor out of the water in less time than it would take to reach the drive well latches let alone actually pulling the motor out. Funny, I would have thought I would be more interested in a motor back in the summer in all the heat. Turns out that I find pedaling way more uncomfortable in the cold weather wearing my Goretex dry suit than in 90 degree heat. The water temp is down around 50 degrees here now and with enough insulation on under the suit to protect us from that cold of water, I find that pedaling with an air temp of around 60 degrees to be a sweat bath. Thanks for the input. Thanks for the link NOHUHU, I'm off to that site now. Last edited by Herbaldew on Tue Jan 03, 2012 7:55 am, edited 1 time in total. Most modern trolling motors have adjustable mounts that allow you to shorten or lengthen the amount of shaft that extends beneath the mount. If you go with a transom mount motor, you should get this type mount and it becomes a simple matter to slide the shaft up or down to get the length you need. I think you'll find that having the prop tips about 4 to 6 inches under the water's surface will be sufficient. This is true and my 3HP had this feature. Problem being, to get the motor at the right depth you can end up with the head unit being as high as your head giving it the feel of riding a motorcycle with "ape hanger" handlebars. If you remove the head from the motor shaft, which is usually accomplished with a handful of screws, you can use a pipe cutter to reduce the shaft length as needed, then reinstall the head. You may have to bore one or two new mounting holes in the top of the shaft. My closest "Warranty Repair Center" for Minn Kota and MotorGuide is actually a guy operating out of his basement. I haven't spoke to him about this, but read of others who have had it done to new motors by their "warranty guy" thus not voiding their warranty. I don't have a bass pro shop nearby to try out a fit thru the drive scupper. Please let me know if it fits. If it does i'm going to order one and mount it thru my custom made scupper plug.